Napier Lion. Exhibit at the Shuttleworth Collection. 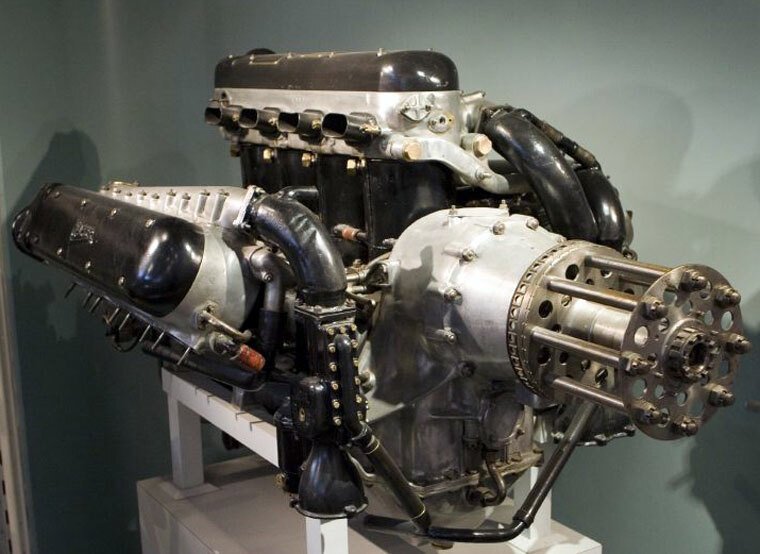 The Napier Lion was a 12-cylinder broad arrow configuration aircraft engine built by D. Napier and Son starting in 1917, and ending in the 1930s. A number of advanced features made it the most powerful engine of its day, and kept it in production long after contemporary designs had stopped production. It is particularly well known for its use on a number of racing designs, in aircraft, boats, and cars. 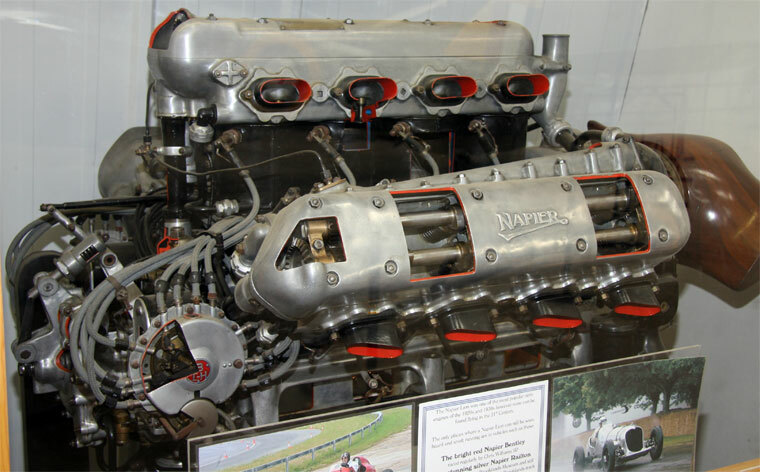 1916 Napier decided to design their own engine and reasoning that the key design criteria were high power, light weight, and low frontal area, the engine was laid out with its 12 cylinders in what they called a "broad arrow" — three banks of four cylinders sharing a common crankcase. This suggested the design's first name, the Triple-Four. Today these designs are sometimes referred to as a W-block, although that designation applies more correctly to an engine in which a common crankcase is shared by not merely three but in fact four rows of cylinders (since a "W" is made of four lines or bars). The engine was also advanced in form, the heads using four valves per cylinder with twin overhead camshafts on each bank of cylinders and a single block being milled from aluminium instead of the more common separate-cylinder steel construction used on almost all other designs. As the most powerful engine available (particularly after a turbocharger became an option in 1922), the Lion went on to be a huge commercial success. 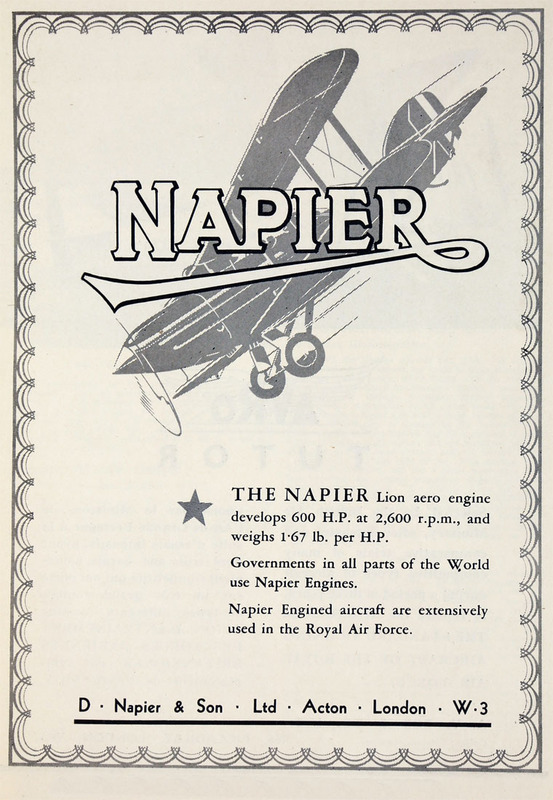 Through the years between the wars the Lion was ubiquitous, and Napier manufactured little else. Between the wars it powered over 160 different types of aircraft. In highly-tuned racing versions the engine could reach 1,300 hp and it was used to break a host of world records: height, air speed, and long distance in aircraft, water speed (delivering 1,375 hp in a highly tuned Lion for 100 miles per hour in 1933) and land speed. Lions powered many of Malcolm Campbell's record breakers (including over 250 mph in 1932) and John Cobb's 394 mph Railton Mobil Special in 1947 — a record that came well after the Lion had passed its prime and stood until the 1960s. The record had been held by British drivers for 32 years. Lions powered successful entrants in the most prestigious event in air racing, the Schneider Cup, in 1922 and 1927, but were then dropped by Supermarine in favour of a new engine from Rolls-Royce, the Rolls-Royce R which had been especially designed for racing. During the 1930s a new generation of much larger and more powerful engines started to appear. By the time the Bristol Hercules and the Rolls-Royce Merlin arrived in the late 1930s, the Lion was too small and old-fashioned. A marine version of the Lion, called the Sea Lion, was used to power high speed air-sea rescue launches operated by the RAF. Another adaptation for the Lion aero engine was propeller-driven motor sleighs, which were used for high-speed transport and SAR duties on sea ice by the Finnish Air Force and Navy. 19xx Lioness Inverted layout, for better visibility.